To celebrate a once-in-a-lifetime moment, you need a unique wedding ring as a symbol of your unity with someone you love. 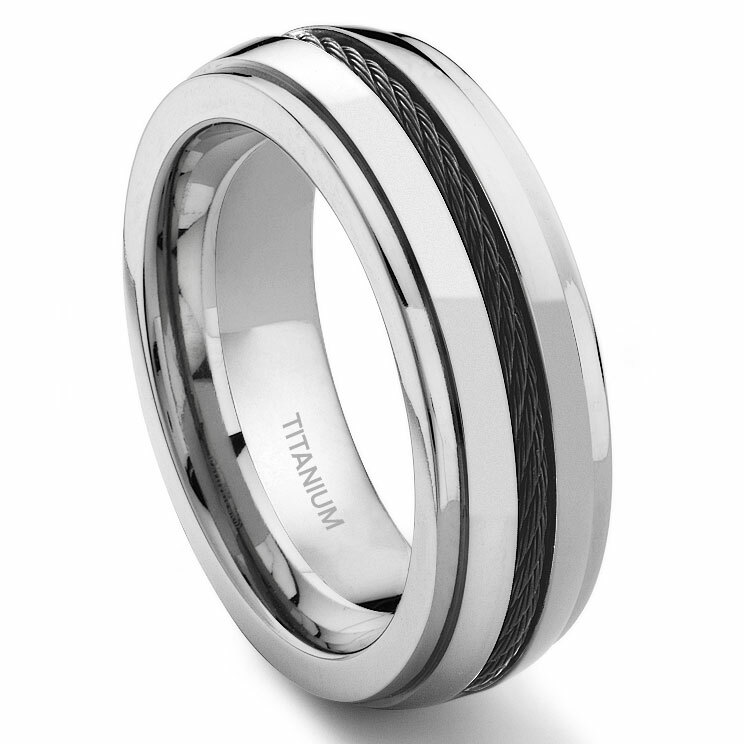 The black cable decoration around this titanium ring creates a very distinctive design, which is truly gorgeous. In addition to its comfort, you could rely on its quality as well. My fiance and I ordered this ring to be his wedding band. We received it, and it is beautiful, but we're returning it for an exchange, because the ring is very wide. He didnt find it comfortable between his fingers, so we chose a different style. Aside from that, its a beautiful ring ... we're sad to see it go back. this ring is awesome! fits perfect great shipping it arrived 4 days after i placed the order on a saturday. I ordered a ring online and when I received it I had noticed that it was thicker than I had realized on the website. Excellent quality, wonderful ring, super fast shipping, and great price! Just didn't work out for my hand. :( But!! Titanium Kay didn't ask any questions, I mailed it back to them, and they gave me a full refund! I am truly impressed with their customer service and smooth transactions, I hope to find something else that fits my taste so I make another order soon! Thanks again! I ordered this ring for a replacement to my husbands wedding band. It's absolutley beautiful and the customer service was outstanding! I will deffinatly purchase from you again! I recently bought a ring for my fiance for Valentines Day. It was a great ring and he loved it. I highly recommend getting it engraved, it makes it all the more special.